JNN 03 Aug 2015 London : A Rare Copy of the Quran that had been expected to raise £1,500 at auction sold for nearly a quarter of a million pounds. The rare 410-page book by 19th Century calligrapher Yahya Hilmi Efendi was bought for £230,000 by an unnamed overseas buyer. 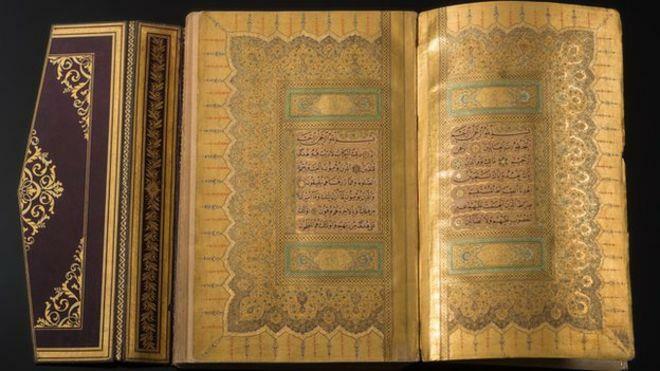 A “pocket” copy of the Quran, thought to be written by the female calligrapher Shah Umm Salamah, fetched £18,000. Both works, which were gifted to the vendor from their employer 20 years ago, were sold in Exeter, Devon, Britain. Auctioneer Richard Bearne, of Bearnes, Hampton and Littlewoods, said the book was believed to have been written around 1876 in Istanbul, formerly Constantinople, BBC reported. In 2014, it was reported a torn page of a Quran, which was estimated to raise up to $60 (about £40), was sold for $86,000 (about £55,765). This entry was posted in Jafria and tagged Quran, Richard Bearne, Shah Umm Salamah, the Quran, Yahya Hilmi Efendi. Bookmark the permalink.